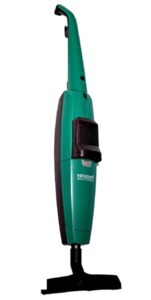 The Bissell BigGreen Commercial Slim Vac has a powerful 1100 watts motor. This lightweight 8-pound vacuum is perfect for small offices or quick pickups. Zipping around for quick cleanup jobs. The Bissell BigGreen Commercial Slim Vac engineered and created to be a light, powerful vacuum cleaner that can handle various cleaning nozzles. All flooring surfaces, from wood floors to area carpets can be cleaned. Use the parquet floor brush for delicate floors. Combination nozzle to tackle other hard floor surfaces. Youalso just add the optional turbine power brush and deep clean. The Easy Hold Handle makes it convenient to vacuum at a vertical angle to clean curtains, along baseboards or stair cleaning. The Bissell BigGreen Commercial Slim Vac has a very low-profile and makes it easy to clean under low furniture. Dust and dirt is collected in a double-layered self sealed dust bag. Changing bags is easily accessible on the front of the vacuum. With it’s by-pass design, the vacuum bag fills from the bottom before the motor and this eliminates the risk of fan breakage. This vacuum is covered by a full 1-year commercial warranty.